A natural tooth has two main components: The Crown and the root. The crown is the visible part of the tooth and the root is located below the gumline, in the bone of the jaw. 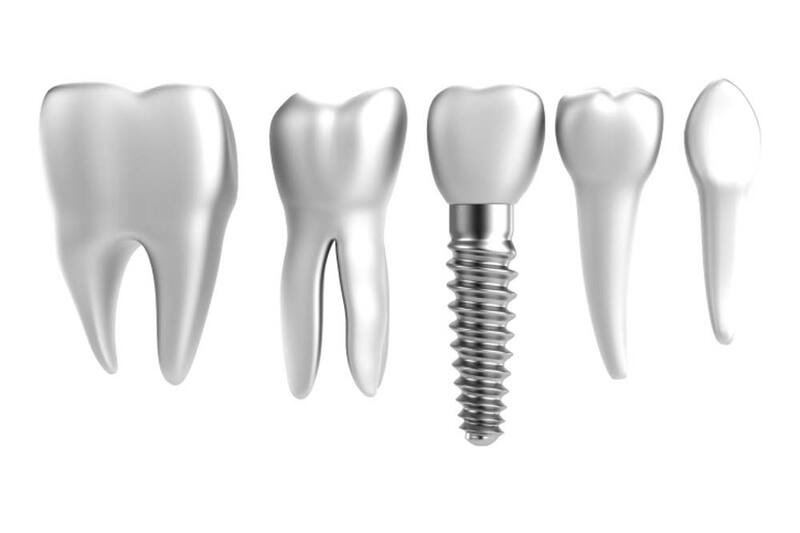 Dental implants can be considered for patients who are missing one or more teeth. A dental implant alone does not replace a natural tooth. An abutment must be mounted on the implant once the latter has been inserted into the jawbone. Depending on the number of teeth to replace, an artificial crown, a full or partial denture or a bridge will be prepared and installed on the abutment(s). If the patient only has one missing tooth, a single crown will be sufficient. If several teeth need to be replaced, many options are available: using a single implant with multiple crowns joined by a bridge or a prosthesis, or using multiple implants with distinct crowns. This choice is up to the patient, according to the treatment plan recommended by the implantology specialist. The insertion of dental implants is a surgical procedure that is usually performed at the clinic and under local anesthesia. Several dental health professionals are qualified to install dental implants: dentists, oral and maxillofacial surgeons, periodontists and other specialists in dentistry. These professionals must have extensive implantology training. Dentists and prosthodontists often specialize in the fabrication of crowns, bridges and dentures that are mounted on the implants.